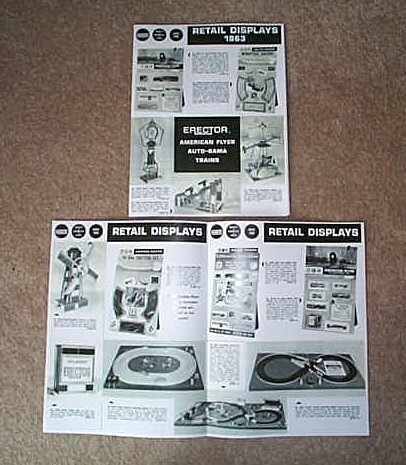 1963 American Flyer Retail Displays Flyer (X863-41). Excellent Condition. - $10.00 : Olson Hobbies, Welcome To The Train Page! 1963 American Flyer Retail Displays Flyer (X863-41). T963-15 Rev. Science Introductory Series. X863-41, 1963 Retail Displays, being offered by the A. C. Gilbert Co. These include Displays for the American Flyer train, with the 20761 Bubble Pack Counter Display, with Burlington Route Steam loco and cars, and 20801 Game Train Set, in it's Bubble Pack Display. Other items covered are the Speedways, Chicane Operating Display, Erector and 35806 HO Accessory Display. This is an excellent copy 8 1/2 X 17 inch, made from my original on heavy bond paper. NOTE: THIS IS A DEALER PROMOTIONAL SHEET ONLY. This item is stamped Reprint. Will mail flat protected with cardboard.